It is an atypical Thursday Night at Waldorf=Astoria, New York. There is a bitter sweet sadness in the eyes of the dashing, illustrious Steve Cohen, as he so welcomes me inside the Lyndon B. Johnson Suite on the 35th floor, where for 16 years and 4850 shows, you could find his jovial smiling face preparing for the next Chamber Magic show, in signature yellow breast coat and blacktop coat with tails. More popular on TripAdvisor than the Broadway hit, Hamilton, Mr. Cohen has brought the elegance and grace of a virtuoso opera star into his Chamber Magic show; reinventing, elevating and revitalizing his craft, in making Magic center stage to none. 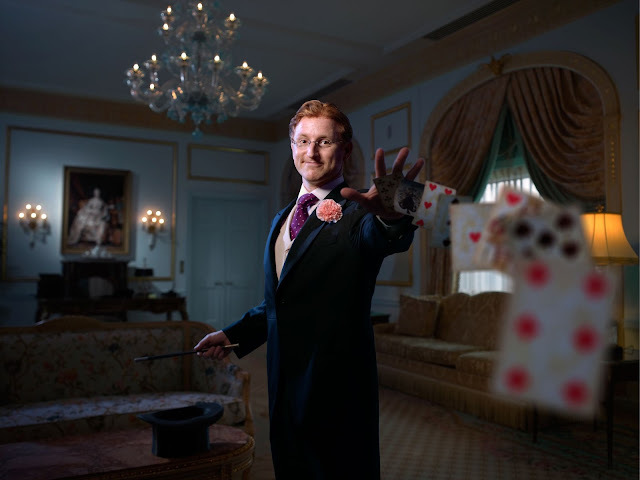 Internationally known as the Millionaires' Magician, Mr. Cohen exclusively entertains millionaires, celebrities, world leaders, celebrated scientists and billionaires in the United States and around the world. Hello, Steve. How did you coin the term "Millionaires' Magician"? When I was living in New York as a young magician, trying to figure out how to make my career here. I had hit a brick wall. There was no differentiating factor between me and a clown you would hire for a birthday party. I met with marketing expert, Mark Levy, who said “Let’s figure out who you are.” Well, I grew up in Chappaqua, New York, around great wealth. He asked, “Who do you perform for?” I have performed for the CEO of Intel, Martha Stewart and Barry Diller. Mark said, “Wait a minute, these are all people who are very well off. In a nutshell, you perform for the filthy rich. What if you called yourself the Millionaires' Magician? And, overtly state that you only perform at exclusive events, positioning yourself as the high fruit on the tree, someone people would have to reach for?“ My response was shaky - I told him that I'll lose all of my clients. That rang true to me, and so to the dismay of my parents, my family, wife, everyone, I printed up business cards and created a website that said, “Steve Cohen, the Millionaires' Magician, Entertainment for Exclusive Events." I thought it would be worth a try. Well, it worked like gangbusters. Suddenly, I wasn't getting calls from random people - my clients became were self-selecting. 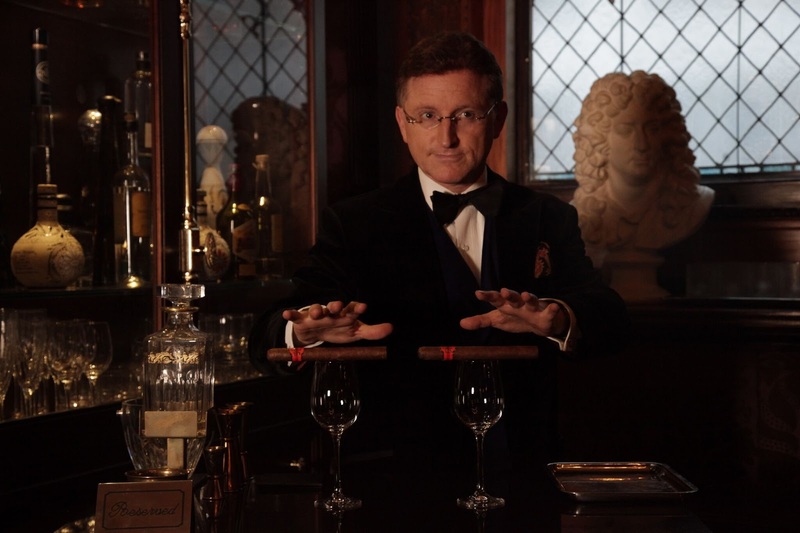 I went to England to perform my Chamber Magic show at the Langham Hilton. The media incorporated this new moniker as if it were a given. The Millionaires' Magician had swept London. In the beginning, you have to fake it until you make it, but in my case, I was using the title and the title itself helped to change my direction. The only people now I perform for are millionaires and billionaires around the world. Did you find the Waldorf or did the Waldorf find you? 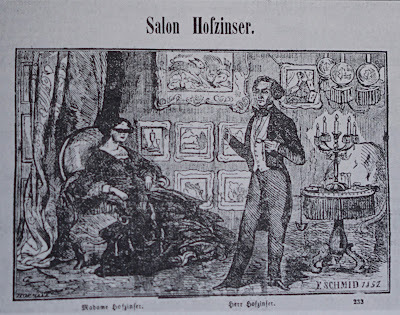 I had a picture of the celebrated Austrian Magician Johann Nepomuk Hofzinser from 1857. 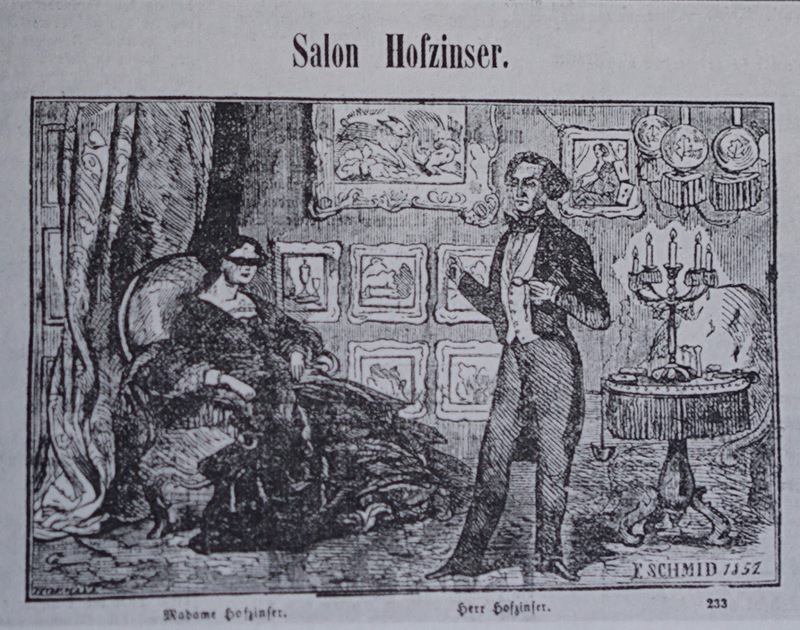 I carried that picture around, showing it to everyone I met, trying to find a room that looked exactly like Hofzinser’s Salon in Vienna. I finally located a similar space at National Arts Club in Gramercy Park. I staged a show there for a few months, but the club was closing for the summer, and I would have to close up shop. Fortunately, one of the guests at my final show introduced herself, and suggested moving to the Waldorf=Astoria. She had a close friend there. At first, the Waldorf employee said "This is the Waldorf! We don't do magic here!" But they were willing to give it a try. I started my first night in The Royal Suite on the 42nd floor, and I have had the same deal then as I did 16 years ago. After the show has ended, I take off my tuxedo, put on my pajamas and go to sleep. That is the deal. The Waldorf has truly become my home. Are there ghosts at the Waldorf=Astoria? After everyone leaves, when the room is empty, I soak it in. I don’t believe in ghosts, but I also don't feel that I am alone. The Pope met Lyndon Johnson right here, where we are standing right now. I don't feel alone. How do you describe your preparation? So, here’s how it works. I practice slight of hand tricks in front of a mirror. When I think I have gotten the rhythm of it down, I videotape myself. Then I examine the video, until the slight of hand is completely invisible. This may take hundreds, or thousands, of repetitions, until I feel it is ready to show an actual living person. But, then, there is a whole other rhelm of practice, which is practicing for people, what I call PP. "People Practice." It has to be done in front of a live person - a scentient being. In order to be a good performer, you have to essentially get out there and perform and put yourself in these uncomfortable situations, possibly being rejected and shut down. Do you introduce new material frequently? The only way you can be truly present, staying in the moment, is by thinking of the audience first. You can't really do that if you are constantly working on new material. Is Millionaires' Magic different than other types of Magic? I take risks all the time during my performance. It inspires me to be less hesitant in my life outside of the performance. So, during the show, I will sometimes go out on a limb -- Say something or do something that could be entirely wrong or a failure. You know, like, risk/reward, when you are an investor. You think, okay. If I put my money into a risky investment, I might loose it all, but I might also win beautifully and spectacularly. As a performer, I love taking those risks, sometimes I paint myself into a corner, just to see how I will get out. I might make limitations on myself. Forcing myself to become aware and alive. Ronald Reagan had a soothsayer advising him on policy decisions. Do you think Magicians are Shamans, curing ills? Well, historically, in the case of the Magician, they have a refreshing way of making you think anything is possible. King Arthur had a Wizard. Charles Bertram was an 1880’s court magician for Buckingham Palace. Bertram returned there many times, so the Royal Family could relive and enjoy many moments of levity, in order to forget thier troubles. Are you any particular scion's favorite Wizard? Hey, Warren, I'm going to buy a ticket to your show. In a tounge-in-cheek way, I put Warren Buffett in his place, which was funny, because at the time, he was the richest man in the world. He had surpassed Bill Gates that year. That was one of the great shows of my life. Would you consider changing your name to the Billionaires' Magician? Probably not. There are too few of them. Just as our time was ending, Steve ushered me into his Salon to show me what I thought was a child's game. The Vaudeville Cup and Balls trick, with three small red balls and three silver palm sized sipping cups. By the end of the trick, I was in shock. How did he get three baseballs inside the palm sized cups, while not diverting my attention away from the cups? Common looking at first, maybe. But, one of the oldest tricks in history. Also known as Acetabula et Calculi or Acetabularii, Cup and Balls dates back as far as Rome, 50-300 BCE. Depicted by Athenaeus in the "Deipnosophistae" and later used by great Magicians such as Matthias Buchinger in 1674. Bartolomeo Bosco in 1793, Louis Kreiger in 1851 and Max Malini in 1873. Steve's book, Win the Crowd: Unlock the Secrets of Influence, published by Harper Collins in 2005, speaks to making one's everyday life more magical. He suggests there are 5 Maxims of Magic: Be Bold. Expect Success. Don't State-Suggest. Practice, Practice, Practice. Be Prepared. As charming as Steve is in person, his book contains interesting, small ways in which to practice boldness. One suggestion is by putting a quarter in someone's pocket without them knowing it -- The absolute opposite of what a pickpocket might do. I imagine it is someone like Steve Cohen who, wishing to remain Anonymous, donates to good causes around the world. 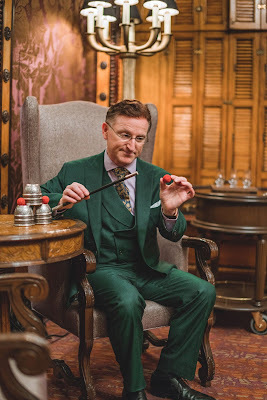 Mr. Cohen's Chamber Magic will continue to amaze starting March 3, 2017 at New York's Lotte Palace, one block away from The Waldorf Towers. Steve’s ninety minutes show started out at 52 dollars a ticket 16 years ago. His final show at the Waldorf, last week, boasted 950 dollars a ticket. Resuming Chamber Magic at The Palace, you can be amazed now for a reasonable 85 dollars. Lotte, The Palace, a New York Staple hotel, featured in Secret Lives of the Super Rich, is listed as one of the 10 most extravagant hotels in the world. And so, the Chamber Magic mystery continues.